Could this happen in a properly wired outlet? Re: Could this happen in a properly wired outlet? For reference, this is what it looks like after a very thin outlet cover hinge clip falls on top of exposed hot and neutral prongs. The result was a tripped circuit breaker, a vaporized hinge clip, and the visible charring. The damage in this and the OP's picture look very similar to me, which suggests the tape measure falling across the exposed prongs scenario. 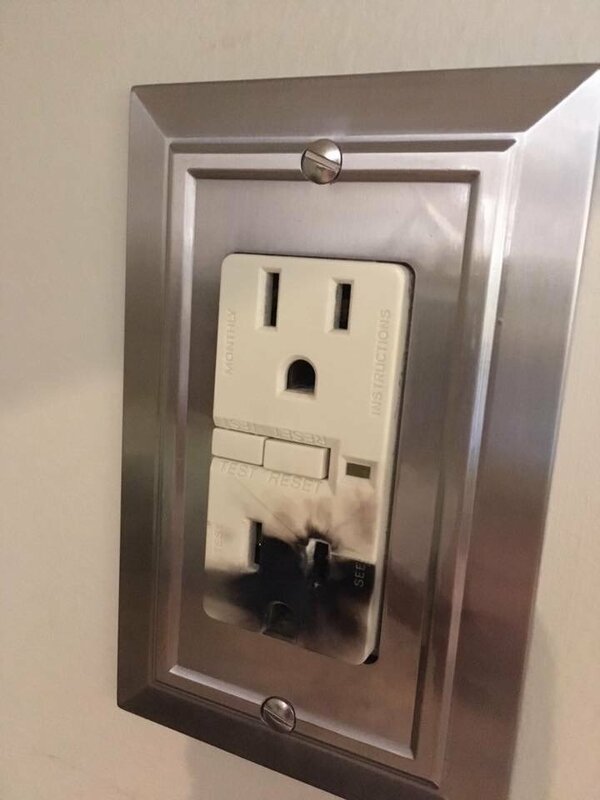 We could lessen the likelihood of such accidents by simply installing receptacles upside down, so that the ground prong would be the first thing struck by a falling metal object. Surely I'm not the first one to realize this. The logic is when pulled downwards (most common direction) earth is the last thing to disconnect. Some countries do things differently. Australian and Chinese 3-pin plugs are pretty well interchangeable, but the Chinese install sockets with the earth pin upwards. In a kitchen it may be clear what sort of appliance should have been plugged into a given socket. Find the appliance and look at the plug. Or find the missing item (eg kitchen with no kettle or brand new kettle) to understand what probably happenned. In many commercial installs, the receptacle is installed ground pin up. Most residential installs have it down. Lots of rationals as to why. Something configured like DIN connector or XLR with the ground shell completely surrounding the pins and longer would be the safest-but we only use connectors like that on low voltage stuff. Note I am NOT suggesting using those particular connectors for mains-just alluding to the design style. She claimed the "metal tape measure brushed up against it" She was measuring and the contact was incidental. I'm waiting to hear back to verify that nothing was plugged in at the time. Yes, in aware it can arc under the proper circumstances, like a "U" shaped piece of plumbing solder inserted into the hot and neutral with a pair or pliers. Don't ask!?!? I didn't think a metal tape that's not inserted at all would be a risk for an arc flash. My vote is a 2-prong appliance was plugged in, almost completely, and the tape measure brushed across the hot and neutral from the bottom side. I don't believe the cover played a part at all. Only if the pic is upside down. Men usually pick option one or don't care. Women usually pick option two. So I spoke with her again. She doesn't remember(?) if a plug was in the receptacle or not. Looking at it again I believe there was. The carbon looks like it originated from the top of the hot slot. It radiates out fairly evenly below and to the sides of the slot. There is a relatively sharp line above the slot where the carbon stops. Presumably masked by the metal tape. There is no carbon to the left of the neutral slot, but it extends below the slot to the edge of the receptacle. This looks like a similar masking of the flash by the neutral prong. I'm not sure how the flash and resulting carbon would stop at the slot if nothing was there. I can't change reality just because you don't like it!
" Presumably masked by the metal tape." You make a good case. That would not automatically trip the GFCI. Page created in 0.069 seconds with 25 queries.